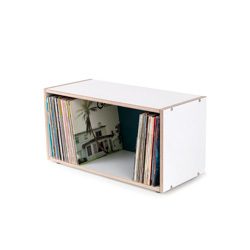 Boksa 2 - the box shelf in birch plywood for records. It can be stacked, rolled, turned and endlessly combined. 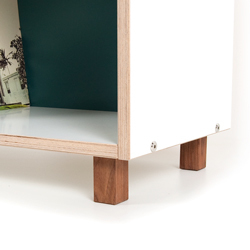 Ideal as filing cabinet, bookcase, Hi-fi / TV-furniture for hi-fi components, as record shelf, sideboard or TV Lowboard - with Boksa you can put together your wall shelf to your liking. Now with wooden back panels in NEW trendy colors - teal, burgundy, charcoal and in classic white! Available with cable hole. 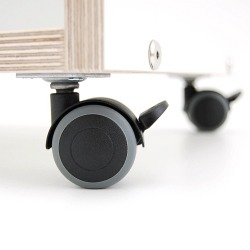 Anti-slip elastic bumpons for stacking BOKSA storage cubes. Divide the given space of you BOKSA cube into 2 shelves with the additional glass pane. This way you gain more space to organise your technical devices like DVD player or games consoles, books, magazines, CDs, clothes, etc. 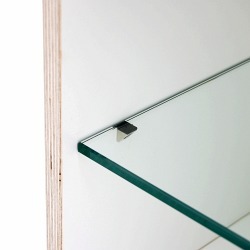 The mounting height can easily be adjusted since the glass panel fittings may be fixed variably. Made of tempered security glass. 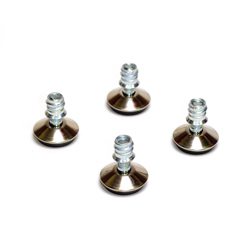 Height adjustable furniture glides made of steel with black rubber socket. 4 pieces set. 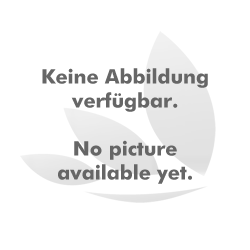 For box furniture system Boksa.